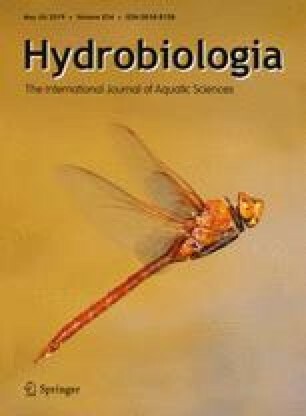 Foraging characteristics of siscowet lake trout (Salvelinus namaycush siscowet) on deepwater sculpin (Myoxocephalus thompsonii) were studied under ecologically relevant downwelling light intensities (9.0 × 108 to 1.62 × 1011 photons m−2 s−1) and emission spectrum (500–510 nm) on varying substrates (gravel, sand, and black fabric). Siscowet reaction distance within our trials increased with light intensity up to 6.0 × 109 photons m−2 s−1, after which reaction distance remained constant with additional increases in light intensity following the Michaelis–Menten saturation function. Reaction distances were not affected by substrate type under any light intensity. The number of prey captures also increased with increasing light intensity, with most orientations toward prey occurring within the siscowet’s forward sector (± 0°–60°, where 0° represents the tip of the siscowet rostrum). Finally, the overall probability of prey capture was positively related to reaction distance at each light intensity. Results suggest that siscowet can visually forage on benthic prey at great depth in Lake Superior, and reaction distance (≤ 27 cm) to sculpin may not diminish until depths exceed 200 m (6.00 × 109 photons m−2 s−1). For assistance with collection of deepwater fishes, the authors thank the crew of the RV Kiyi. Funding for this project was provided by the US Geological Survey, Lake Superior Biological Station, University of Minnesota Duluth Biology Department, and National Science Foundation Grants IOS 1354745 and DOB 1359230 (AFM). The authors are grateful for the help and support from I. Harding, M. Pawlowski, J. Dobosenski, Minnesota Sea Grant, and the McNair Scholars Program at the University of Wisconsin-Superior. A special thanks to M. Joyce for help with statistical aspects of the paper, B. Matthias for his helpful editorial comments, and R. Mahling for his modeling expertise. Any use of trade, firm, or product names is for descriptive purposes only and does not imply endorsement by the U.S. Government. Pratt, T. C., O. T. Gorman, W. P. Mattes, J. T. Myers, H. R. Quinlan, D. R. Schreiner, M. J. Seider, S. P. Sitar, D. L. Yule, & P. M. Yurista, 2016. The state of Lake Superior in 2011 [online]. Available from: http://www.glfc.org/pubs/SpecialPubs/Sp16_01.pdf [accessed 3 November 2017].